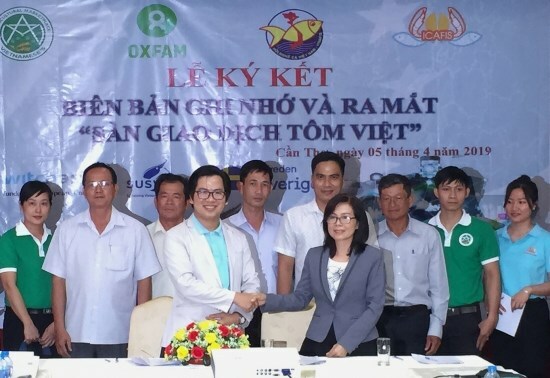 Vietnam’s first shrimp online transaction floor made its first public appearance in the Mekong Delta city of Can Tho on April 5, helping farmers get the highest possible prices for their product and updates on the cultivation and trade. Speaking at the launch of the floor, representatives of the operators said at present, it provides farmers with services on the fluctuation of prices, market analysis, and non-cash payment, adding that it hopes to directly connect processing plants to foreign importers. Instead of selling shrimps through go-between like now, farmers can offer their products at http:/cnsv.vn. They further added that joining the floor, farmers will be kept updated on prices and demand – supply balance through analysis and assessment.